Wed, Oct 17, 2018, 09:40 am SL Time, ColomboPage News Desk, Sri Lanka. 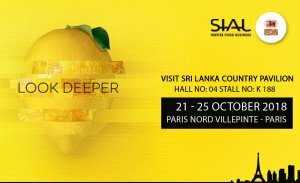 Oct 17, Colombo: Sri Lanka Export Development Board, Sri Lanka Tea Board and Coconut Development Authority are organizing pavilions at the Salon International de l'Agroalimentaire 2018 (SIAL 2018), the world's largest food innovation exhibition to be held from October 21 -25 at Paris Nord Villepinte, France. EDB pavilion will be located in the Hall No.4 Stall No. K 188 in the country pavilion section. EDB has organized participation of 14 export companies under the Sri Lanka Pavilion and two SME companies will participate as observers. SIAL is dedicated to the agri-food industry, food retail and institutional & commercial catering. SIAL not only provides the opportunity to pinpoint future commercial successes but also to meet with new business partners with a view to fruitful co-operation in the future. All sectors of activity are represented: grocery products, fresh produce and dry goods, frozen food, semi-processed food products and ingredients, seafood products, organic food, meats, and dairy products along with the wine exhibitors, producers and merchants who will enable one to explore a wide variety of wines, produced worldwide. SIAL also showcases the latest food trends in Europe. The exhibition consists of pavilions such as Beverages, Fruits & Vegetables, Organic, Confectionary, Wine & Spirit, Ingredients and Country Pavilion section. SIAL Paris 2018 is estimated to draw in some 160, 000 enthusiastic visitors from 194 countries who will discover the latest and the most innovative products by some 7200 exhibitors from 105 countries.